AsiaLIFE Cambodia’s Publisher Mark Bibby Jackson ventures to the Gulf of Thailand to discover that Kamalaya Koh Samui’s de-stress package is not quite as he anticipated. I didn’t know what to expect. Images of Anthony Hopkins playing Dr Kellogg in The Road to Wellville merged bizarrely with Carry On Camping – only up-scale – when I signed myself up for a five-day Asian Bliss package at the multi-award winning wellness sanctuary and holistic spa Kamalaya Koh Samui. By the third day of my stay, I realised it was nothing like either. I was not alone in my misconception. Before I could determine why Karen had chosen to resolve her issues at Kamalaya rather than over a glass of chilled pinot grigio with friends, I was whisked off to an Ayurvedic massage – a flimsy brown sarong protecting my modesty. 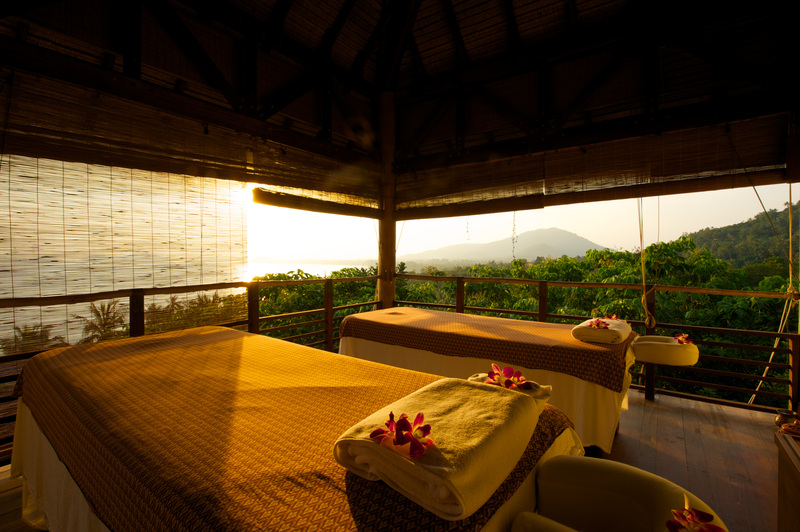 According to Kamalaya’s managing director, Marc-Antoine Cornaz, Karen’s reaction is typical of many first-time visitors. Sharing lunch by the pool – a delightful cucumber and melon salad that would become my mainstay over ensuing days – he explains that many guests come to seek a cure for something, only to discover that their ill lies much deeper. The problem is not so much that you are drinking 21 cups of coffee a day, but why you are drinking them. Kamalaya treats the mind and body as one and provides space for guests to ask the questions they never knew needed answering. It is an approach that has reaped a plethora of international accolades such as Destination Spa of the Year: Asia and Australia at the World Spa Awards 2014 and Best Overseas Health and Wellness Property, Luxury Travel Magazine Gold List 2014. The Asian Bliss programme is designed for top executives needing to recharge their batteries. It offers various forms of Thai and Indian massages interspersed with more meditative options such as reiki, yoga and pranayama – a traditional Indian deep-breathing technique. Unfortunately, my one-to-one sessions merely served to reinforce my total inadequacy in all things new age. I already knew my body had the suppleness of an oak tree, but up to this point I had mistakenly believed that I was a master in the art of breathing. My folly soon became apparent when my diaphragm expanded after being urged to contract, as if it knew something my instructor did not. Her look of resignation upon the conclusion of our session reminded me of a dance teacher who once naively tried to explain to me the fundamentals of salsa. By the second day, I had decided to take the path towards detoxification. I had spent the previous day marvelling at the range of healthy choices on the menu, only then to deny myself most of them. Gone were meat, fish, egg, dairy, wheat and corn. Raw vegetables and lentils replaced a variety of other ingredients including tomato, aubergine and peanuts. “Which day?” asks a German woman passing me at breakfast, having noted my preference for all things detox. “The first two days are really tough,” she confides, “but after that it gets easier.” I felt as though I had just enrolled at the Betty Ford Clinic as she explained how she had more energy than before. I almost expected to discover an ‘I took the detox course and survived’ sticker on her blouse. As forewarned, the first day of my puritanical diet was accompanied with a dull pain at the back of my head, but truth be told it was no worse that the morning after a heavy night before. If anything, I felt reassured that the long-stored toxins had finally got the message that they had outstayed their welcome. Actually, I found my new regimen a relative stroll in the park. Having been a vegetarian for many years in my pre-Asian existence, I derived a reassuring familiarity from the restricted diet. However, those with a more carnivorous mind-set might find it difficult to forego the steak and ostrich meat – it’s apparently very lean – offered within the “beware” section of the resort’s menu. By the third day I felt positively rejuvenated. I had fallen into a familiar pattern of waking to the sound of birdsong in my green oasis, before taking the steep climb uphill to the wellness sanctuary for my next treatment. I soon became confused as to whether it was my feet, hands, head or stomach that was due to be massaged, not that it mattered much as each treatment seemed to involve a mix of any of the above. They were also consistently excellent, and I found my mind drifting off into the beautiful lagoon that lay beneath on more than one occasion. According to Cornaz, part of Kamalaya’s philosophy is to treat people like adults, “not like a boot camp”. Most guests are successful business people suffering from burn-out or seeking to overcome a recent trauma – hence the choice of red wine or carrot juice to accompany your steak or yellow lentil soup. But most important of all is for guests to enjoy their experience and to be one with the surrounding nature. “After all they are all on holiday,” he says. On my last day I decided to turn off my mobile phone and store my laptop away. Mobiles are banned from communal areas, as is smoking, and it’s amazing how much time you have once you decide to block off external distractions. I spent a peaceful morning lazing by the beach in a hammock, reminiscing holidays gone by and reading Sebastian Faulk’s Birdsong. At the end of my five days I was totally rejuvenated both in body and mind. After the beach, I ran for an hour on the treadmill – something I have not managed for ages – and woke the following morning with no muscle stiffness. This morning I wrote an article for a magazine in Thailand while waiting for the plane at Koh Samui airport. The words flowed as though I were Mr Faulks himself. Whether I will still feel this fresh by the time you read this article is as much down to my willpower as to the efficacy of the printer. The approach of Kamalaya is both holistic and slow. Unlike Dr Kellogg, there is no magic wand of fasting followed by a colonic irrigation and ice-cold bath. Instead there are personal choices that continue after you leave Kamalaya’s cloistered confines. Not that I would have it any other way. After all, as Cornaz says, we are all adults. For more information about Kamalya Koh Samui, visit: www.kamalaya.com.